The last couple of weeks have been incredible. On June 4, 2018, I joined Andela as Content Marketing Coordinator. After a 14-month long break/detour from Tech (I worked in Digital Advertising for all of 2017 and until May), my path brings me back here. But I could not truly leave tech. 2017 was when I started to write forLoopWeekly. And it became the platform that would rein me back into tech full time. It was literally the little letter that could indeed. I’ve been here just over a month now, and, typical of life in tech, time does this weird thing were its linear attributes fade into the night. It already feels like I’ve been here for much longer, seeing as I quickly jumped into the fray the moment I walked in through the door. On my third day in, I got a Slack message from my manager, Christine Magee, requesting that I send her a couple of sentences about myself – background, what I’m passionate about and why I joined the company. A bio of sorts to introduce me to the organization, basically. That’s when I sort of did a proper reflection on why I chose Andela, obvious perks aside. You know, I’m not sure I thought as hard about it when I was asked the same question during one of the interviews as I did this time. I feel like, for interviews, you’re in a promotional frame of mind, that almost anything you say will (and should) be taken with a pinch of salt. But this time I was in already. I’d signed a contract and had started immersing myself into the maze that will form the fabric of my work life for the foreseeable future. I must have given a good answer – an apt one, even – during the interview. But I now had to come up with one that I truly resonated with on a visceral level. One that I truly believed, whether it sounded promotional or not. Yep, it still reads like a soundbite. But it is true. 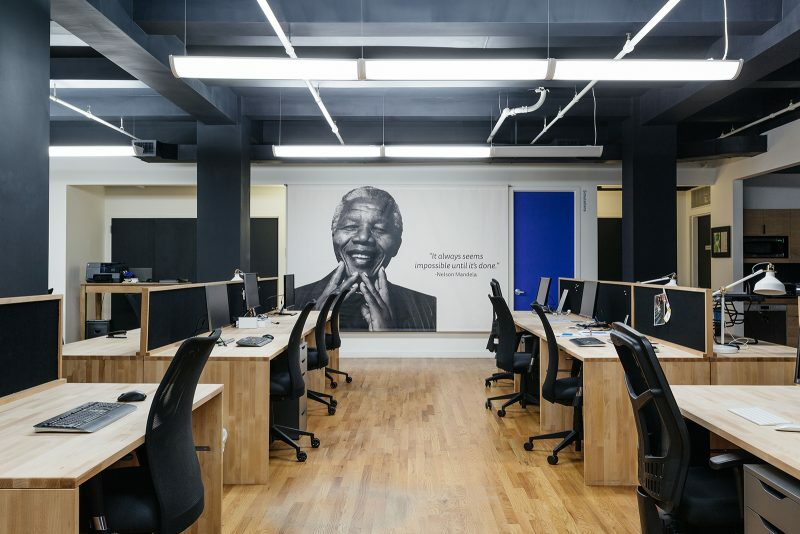 Andela actually has skin in the game when it comes to advancing human potential on this continent. With 800+ devs currently under its banner and with all the programs and initiatives it powers to mint and empower several thousands more, Andela shows that its mission statement is something that holds much deeper purpose than just being cool enough to slap onto T-shirts and car bumper stickers. A conversation I’ve had with a few of my friends in this industry is how there are far too few companies in the African Tech ecosystem with enough bandwidth to sustain and grow talent beyond the first 3 quarters – or one year, at most. It usually starts to feel redundant after a year, as employees who are more driven begin to get antsy and uncomfortable with being on a treadmill. And this is not to slate the ecosystem or anything – it’s a really young and small ecosystem, and there just aren’t many huge companies dotting the landscape. Yet. What usually happens – as Justin tweeted in March, is that many switch companies as a way to get that needed high that a promotion – and a pay raise – brings. But after a while, about two quarters in, the extra padding on your pay starts to count for nothing. Because you’ve hit the roof again, and the redundancy has set in. Then you keep playing until another company makes you a slightly higher bid, and the cycle continues. Until you grow weary of the treadmill and exit the ecosystem altogether. This ecosystem needs more Andelas. We need to build several considerably large tech companies to form the fortresses and institutions that’ll shape the future of talent and work on this continent. So that when people ramp up on their skill sets, there’ll be befitting work for them to do here. And we also need more small startups as well. To solve problems and help give many the start that they couldn’t possibly get elsewhere. Andela is robust and dynamic enough that I know I won’t be bored for a long, long while yet. All the stints I’ve had in the past have all prepared me for this, somewhat. But the learning curve on the path ahead is steep enough (with many sub-summits, if that makes sense) that I shan’t be hitting the ceiling soon. And that’s a good thing. In the 3 years since I applied to and failed to get into the fellowship, I’ve stuck around the ecosystem and honed my more natural talent for content. And I’m back here now, not as a fellow, but as a content guy, a storyteller, if you will. I join other amazing staffers – Guardians of the Fellowship – who, while not writing lines of code or building products, contribute immensely to Andela’s mission to advance human potential by powering today’s teams and equipping tomorrow’s leaders. Here’s to all the good work we’ll do across the many, many quarters to come.